M. Y. Eqbal is a Justice in the Supreme Court of India from 24-12-2012 to 12-2-2016. Justice Eqbal was born on 13th February, 1951. He completed his initial education from Ranchi Zila School in the year 1967. After obtaining his bachelor degree in Science from Ranchi University, he pursued his Degree in Law and obtained degree with 1st Class Distinction (Gold Medalist) in the year 1974. He started practice in the year 1975 in Civil Court. He was appointed as a Government Pleader in the year 1990, and was later appointed as Government Advocate in Ranchi Bench of Patna High Court in 1993. Due to his profound knowledge of law, he was elevated to the Bench and he became Judge of Patna High Court on 9-5-1996. Later he became Judge of Jharkhand High Court on 15-11-2000. 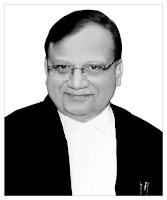 On 11-6-2010 he was elevated as Chief Justice of the Madras High Court and he served there till 21-12-2012. On 24-12-2012 he became a Judge of the Supreme Court of India. Kerala Public Service Commission & Ors. v. The State Information Commission & Anr. [4-2-2016] – Supreme Court held that Public Service Commission shall provide Information about answer sheets and Marks under the RTI Act. Parivartan Kendra v. Union of India and others [7-12-2015] - Supreme Court directed all the States and Union Territories to consider the inclusion of the names of Acid Attack victims under the disability list. Archana Girish Sabnis v. Bar Council of India and others [26-11-2014] - Supreme Court observed Pursuing law and practicing law are two different things. One can pursue law but for the purpose of obtaining license to practice, he or she must fulfill all the requirements and conditions prescribed by the Bar Council of India.